Oracle Team USA won both races on opening day at the Louis Vuitton America’s Cup World Series in Gothenburg, but Land Rover BAR and Emirates Team New Zealand had good days as well with second and third place finishes respectively. In fact both races saw the same teams in the same top three positions, meaning there isn’t much separation on the leaderboard. “This was almost like a warm-up," said Oracle Team USA skipper Jimmy Spithill. "It's all about tomorrow when the points are doubled - Super Sunday. But that being said, I'd rather be in our position. We're sailing well, we're confident, and we'll be ready to go." His closest pursuer said quick starts allowed the winner to separate from the herd in both races and that was the difference. 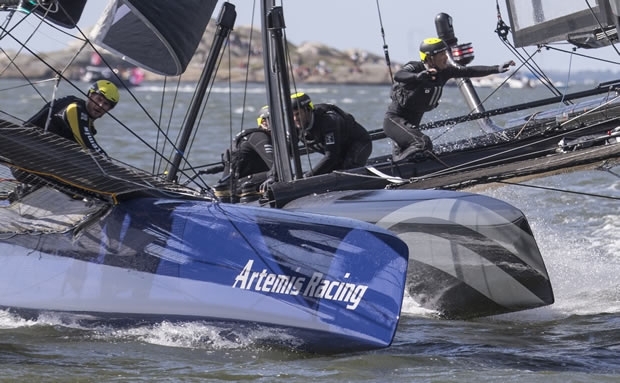 It was a difficult day for the hometown Artemis Racing who had a mid-fleet finish in the first race before going aground after the finish and damaging their foils. The team was able to sail the second race, but at reduced efficiency which impacted on their last place finish. “This morning we said we just needed to have a solid day to be in the mix for the double points on Sunday. We didn’t really have much chance in the second race today, but everyone is still quite upbeat,” said skipper Nathan Outteridge. "We made mistakes but it’s all about how you recover. We’ll get the boat fixed up and be ready for tomorrow. Racing resumes on Sunday at 1300 CET. Points are doubled for Sunday's two raes.